Accelerate your exosome studies with these ready-to-use purified exosomes from pooled human CSF from healthy donors. Whether you’re looking for exosome standards, performing functional studies, evaluating biomarkers, or engineering exosomes for therapeutic delivery, you can get your research moving faster with our ready-to-use exosomes isolated from the pooled CSF of healthy human donors. Our purified exosomes from pooled human biofluid samples come from healthy donors and include exosomes isolated from serum (Cat.# EXOP-500A-1), urine (Cat.# EXOP-520A-1), CSF (Cat.# EXOP-530A-1), and saliva (Cat.# EXOP-510A-1), with more biofluids on the way. 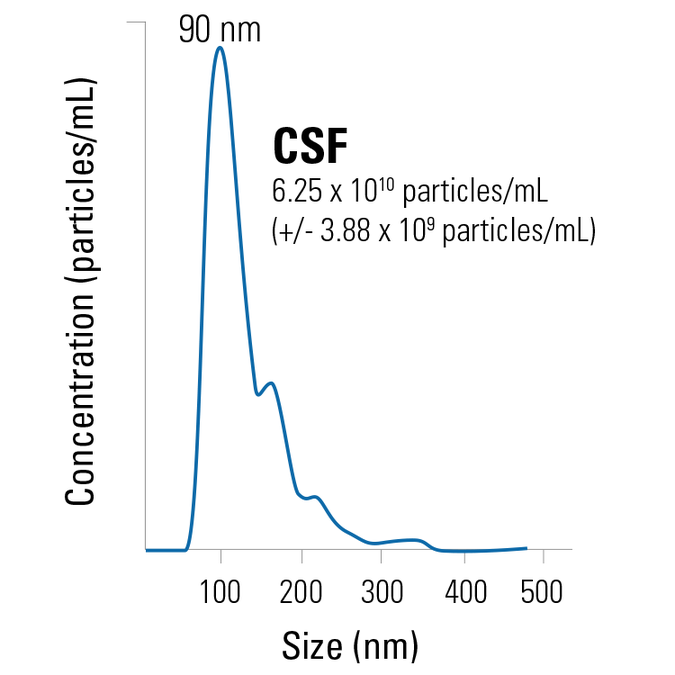 Each lot of exosomes is carefully characterized for particle size and concentration by NanoSight™ analysis, and expression of specific exosome protein markers validated by Western blot. Purified exosomes are stored in 1x PBS, and each unit contains 25 µg of exosomal protein. Lot-specific NanoSight and Western blot data are provided to ensure lot-to-lot quality and consistency. Each vial has enough material to run approximately 5 lanes in an SDS-PAGE gel (5 µg protein/lane). Figure 1. SBI’s Biofluid Exosomes contain expected protein markers as shown via Western blot analysis. The amount of protein loaded on each gel is as indicated. Figure 2. NanoSight analysis of Biofluid Exosomes show expected size distributions. Concentrations in particles/mL are shown, with the particle size mode reported on each plot.